We are just a group of buddies that also make a living with our tree service company in St Marys county in Southern Maryland. Well…. as a group of friends who also work together, us Tree Guys say that a lot. We don’t plan on using our real names, or any real customer names. You know, for privacy reasons and all. But we do intend to mention local areas around St Marys county and Southern Maryland because, after all, that is the area we live and work in. Full disclaimer: We intend to waste your time with stories that we find absolutely ridiculous, downright absurd, & occasionally funny. We decided to call ourselves the St Marys County Tree Guys for a reason. And no, not just because we think it’s cute. We don’t want everyone in the world to know who we are. However, we would like those that already know us to enjoy our stories and know it’s us. Some in our small group of guys knew each other before we all started working for the local tree service company. A few new additions to the clan came along after they decided to work with us as tree fellers and arborists. We are made up of a hodgepodge of backgrounds. Some come from families with children, one guy is divorced but has a dog, and a few are young and single. Most of us grew up in or near Southern Maryland. It has been said that the arborist business is one of the most dangerous jobs in St Marys. We’re all experienced climbers and have often had to climb trees we would never let our children climb. Most of our climbs are because of large trees needing to be trimmed. This could be before or after a storm. Some homeowners are aware that they have limbs that could come down during the next storm. Other homeowners realize that after the storm comes and they’ve got a giant limb on the roof of their house. 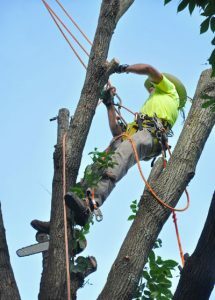 We pride ourselves in being a tree removal in St. Mary’s County company that can handle any job, big or small. Copyright © 2019 St Marys County Tree Guys. Powered by WordPress. Theme: Accelerate by ThemeGrill.